Listen, when you wear these Red and Green Elf Tights, you're not just becoming the epitome of Christmas Spirit, you're representing history! Back in the late 1400s, the menfolk work their breeches and hose as one article of clothing. These tight, fancy threads were made of expensive fabrics such as silk and velvet, and were often embroidered and colorful. And sometimes, if you were really baller? Then each leg of these sweet tights was a contrasting color. 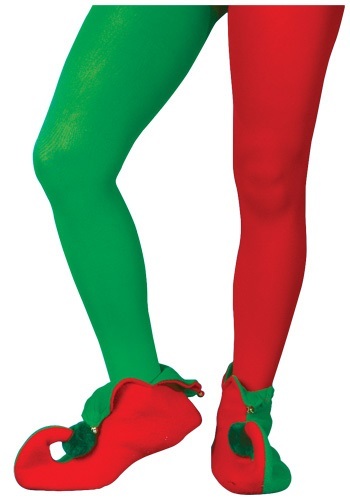 So when you wear these Red and Green Elf Tights, you're not just saying, "Hey, I love Christmas, and I've got the gams to prove it! "...you're also saying, "Hello, good sirs and ladies, might you know of whence these tights originated? Well if you be of such high education, then you surely divine that I possess what one might call seasonal swag..." Pair those tights with some soft, pointy-toe shoes and you are ready to dominate those Christmas gatherings with both your festive style and knowledge of somewhat-useless medieval textile history!